handspun | Stitch, Brinn, Stitch! 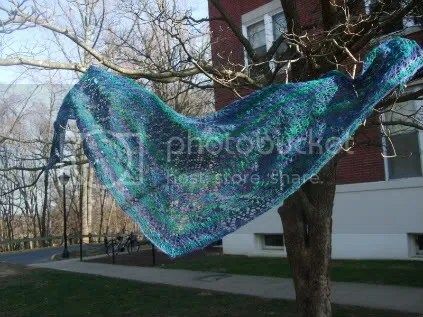 You are currently browsing the tag archive for the ‘handspun’ tag. I know, I’m the worst blogger. 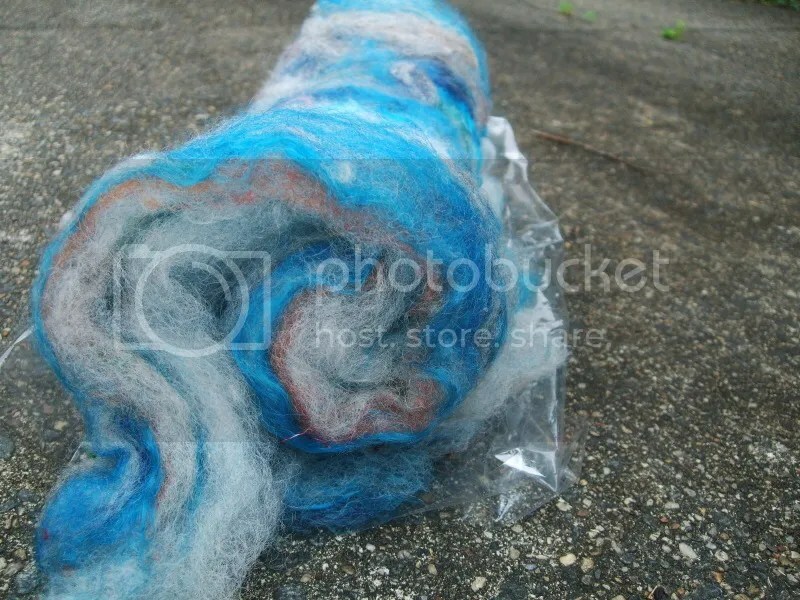 Anyway, I finished a thing I’ve been working on for literally months: I spun a fleece! 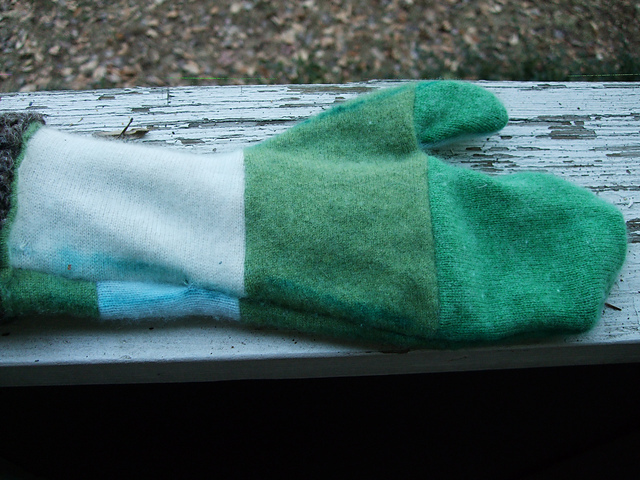 Okay, it wasn’t a whole fleece, it was only about 1.5 pounds. 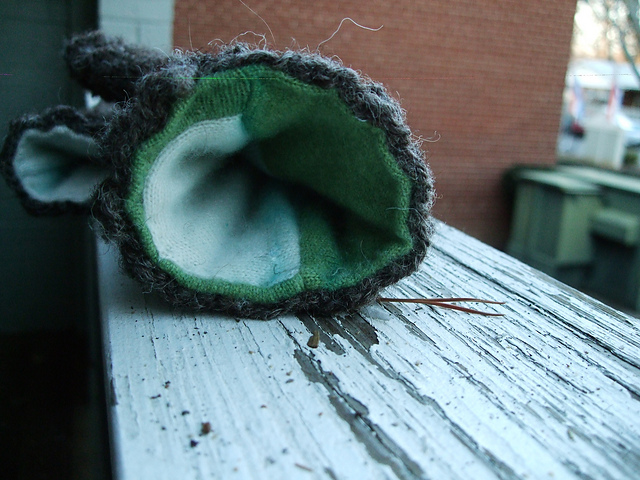 But it was 1.5 pounds of sticky, greasy fleece with very little discernible lock structure. I have no idea what breed of sheep it is. I got it when I bought my loom (I’m pretty sure I just mentioned it in passing). I’ve mentioned this project on the blog before. It’s a hot mess, I know. 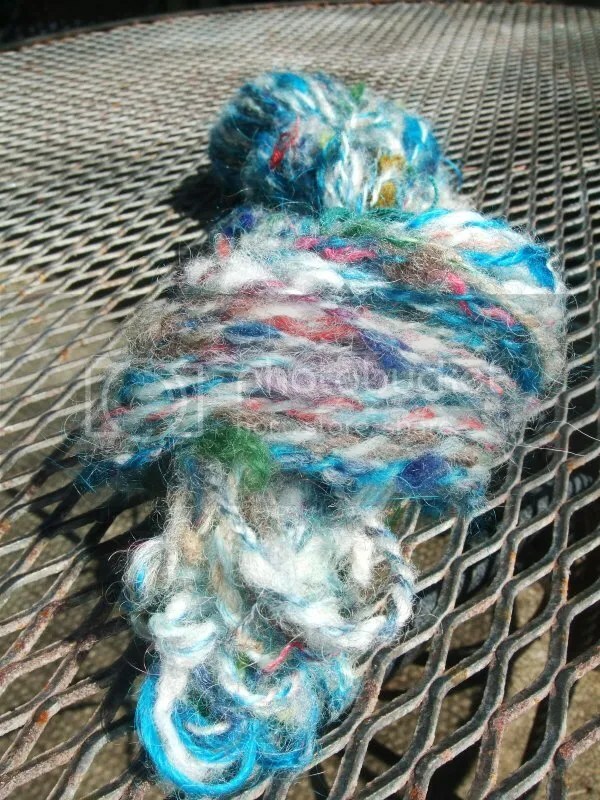 Anyway, I smacked the fiber into line with my Schacht hand cards and spun it into super chunky yarn. 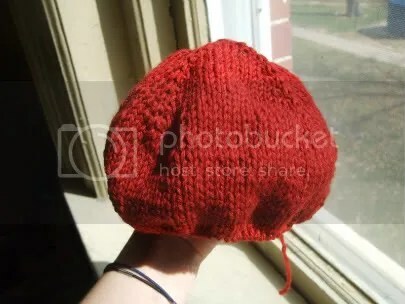 Which actually turned out to be more of a worsted weight, but y’know. It’s rough and uneven and still a little sticky but it’s DONE. All six skeins. 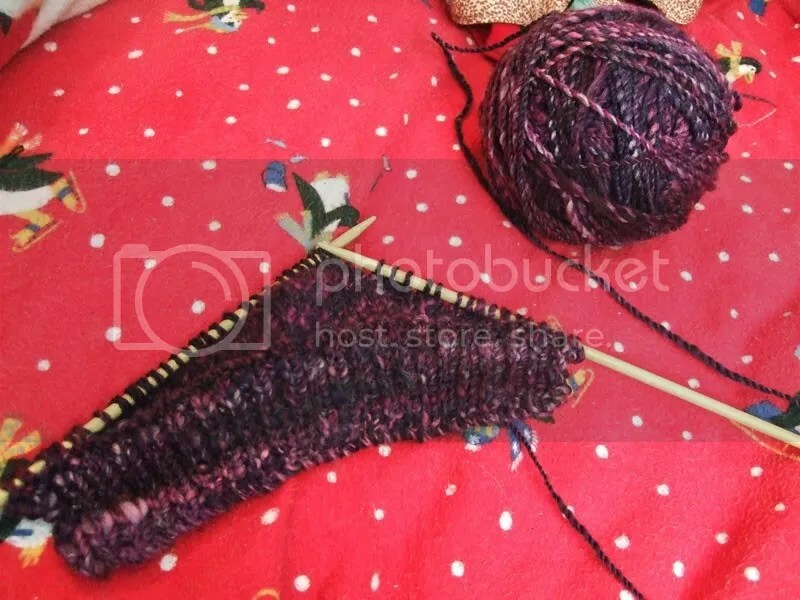 A total of almost 700 yards (686), which is enough for a smallish sweater. I won’t make a sweater probably because it’s pretty rough and there’s not enough for a serious waterproof outerwear sweater (which this yarn would be perfect for). I have no idea what it will become. Maybe some day it’ll become a serious waterproof sweater jacket for a tiny person (read: child). 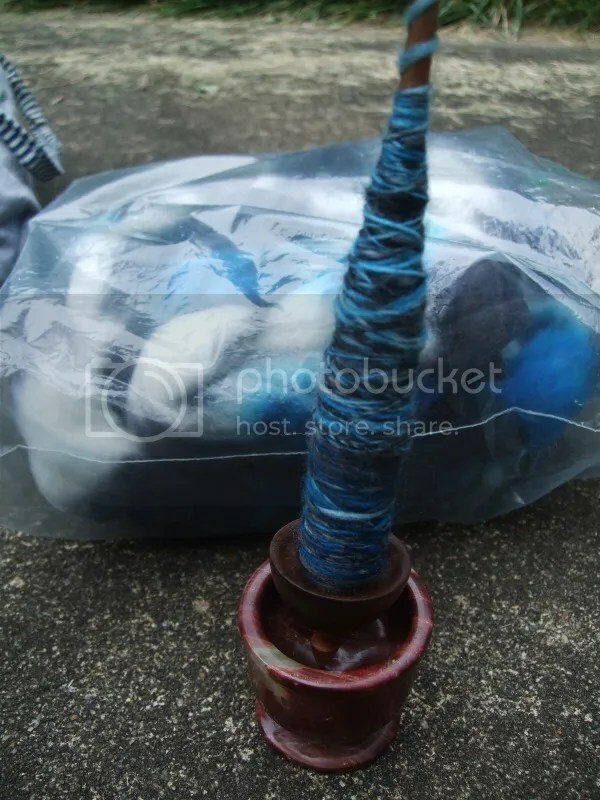 It would have to be my own child though because of the sheer number of hours that went in to spinning this stuff. For the time being, it’ll just marinate in the stash and think about what it wants to be. 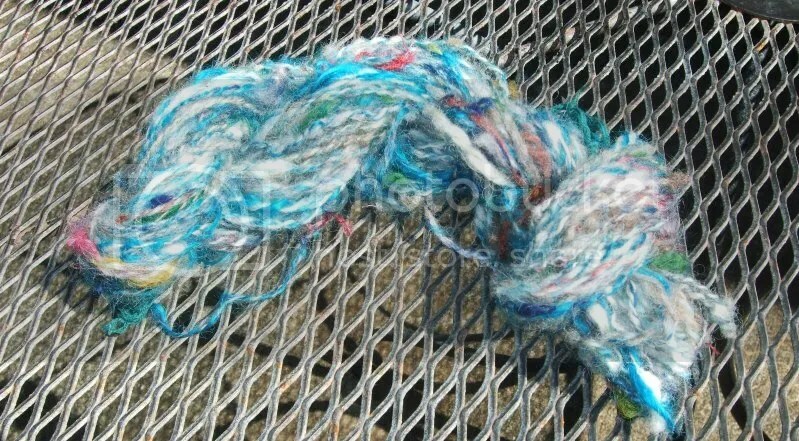 I spun this yarn woolen, and it actually did puff up a bit with washing. I suspect that if I wash it in some grease-fighting dish soap it’ll puff up even more. (As it is, I just dunked it in a bucket of warm water with some Euclan, swished it around a bit, then let it soak for an hour.) 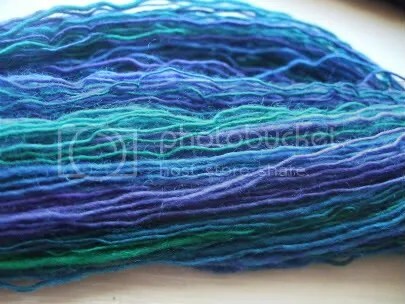 I have since started another spinning project (some soft beautiful merino that is nothing like this coarse mystery wool), and I spent so much time spinning woolen that when I went to spin the merino worsted, I forgot how. I’ve picked it back up again, no worries. In life news: I did not get the position that opened up at work (I wasn’t even aware they had been taking applications, actually) and I haven’t heard back from my other prospect yet. Looks like I’m stuck at the reception desk for the time being. Which is okay, I guess. If Congress (sorry to get political here, kids) can grow up and stop acting like petulant kids, I can even buy health insurance (which I am currently without) on the market, fixing part of my dissatisfaction with my job (which is to say low pay and no benefits thanks to being a temp). And I’ll start looking again for a better, more permanent position that requires me to do work that doesn’t make me all anxious (which is to say writing or editing instead of answering phones). Anyway. In fan news, I am still watching through SG1 because it is the best ever. I’m currently on season four, which is the best season, hands down. There’s very little filler, a couple of truly excellent episodes, and tons of Jack/Carter shipping (and you know I’m all about that). At AUSA a couple of weeks ago (did I mention I went to Anime USA? I can’t remember–I did and it was fun and I took zero photos) I bought an SG1 patch (like the team patch) and a SGC patch (the one with Earth and the stars and the symbol for Earth), so I’m going to look for a green jacket/shirt to sew those on to. Katsucon is in February and I’d like to cosplay as Sam Carter. My hair will be pretty long, but I think I can tie it back or wear a baseball cap and it’ll be okay. Her hair gets pretty long in the later seasons anyway. In reading, Joe and I are STILL reading I, Jedi (I can’t remember if I’ve mentioned it before, but it’s been literally months). Part of the problem is that there are a billion other things I want to do and part of the problem is that the first third of I, Jedi is really annoying. It is muchly a rehash of everything that happened in the Jedi Academy trilogy except with Corran thinking he’s so freakin’ special that everyone on Yavin 4 would be Sith meat without him there. It makes sense stylistically since it’s written in first problem and it’s been previously established that Corran’s biggest flaw is his arrogance, but still. In the passage we read the other day they finally beat the Big Bad (well, the one from Jedi Academy anyway), so hopefully things will be more interesting from here on out. Mara has been great though. I mentioned when we were reading the Thrawn books how much I adore Mara, and it hasn’t changed. She’s The Best and I Love Her. Sorry for that last paragraph if you’re not a huge Star Wars nerd like I am. And if you are: I’m considering making a cross stitch with the Rebel crest and the words “I aim to misbehave”. Because everything’s better with multiple fandoms. It’s only about 50 yards of a dk-ish weight. 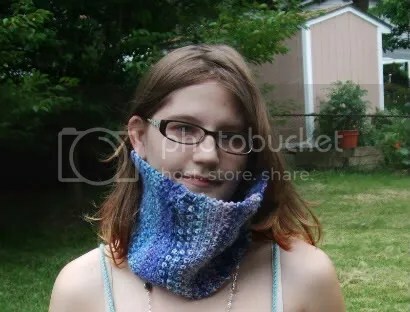 Not sure I’ll ever knit it into anything (maybe a little stuffy). It’s kind of the ugliest yarn ever, but as my first supported spindle skein, it’s not bad. This one required a ton of predrafting because the fiber was so compacted, but it came out pretty nice. I navajo plied it. 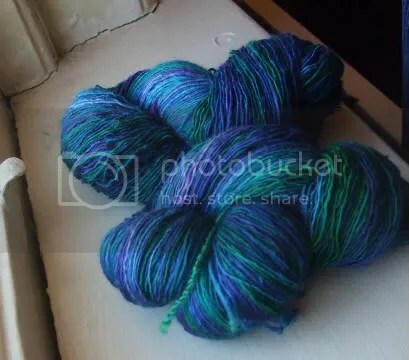 Not sure of the yardage but it’s a tiny tiny little skein. Mostly just decoration I think. The fiber is the other half of a four oz braid I got somewhere online a while back. 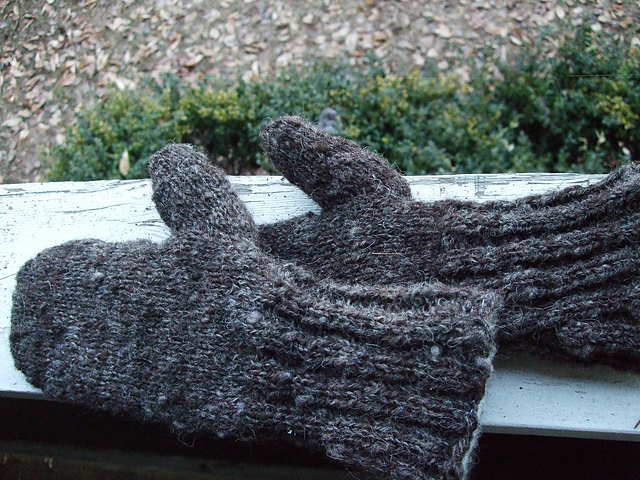 It’s merino in the color way “Storm Front Coming”. I bought it from LakeHouse Loft on Artfire I think. 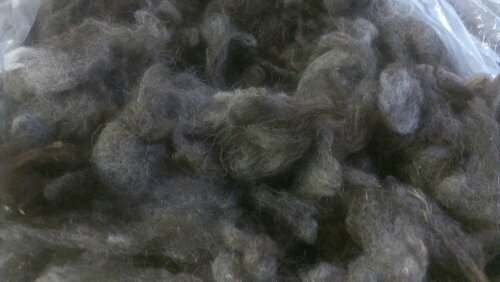 It’s pretty compacted from being smooshed in my stash, but it’s spinning up pretty evenly. So yay. A note on the spindle bowl: I was previously using a tiny tea cup. When I was in the Outer Banks, I went to a store called Michael’s, where they sell all manner of fossils, shells, geodes, stones, etc. They had a bunch of stone mortar and pestle sets and I was going to get one to use as a spindle bowl. On the last day, I spotted one that had been marked down for its missing pestle. Perfect. So I got an amazing spindle bowl for $5. It’s stone, so it’s good and solid and won’t tip over. WHOOT. Pattern: Uh, none. CO 30, knit in linen stitch, seam together. 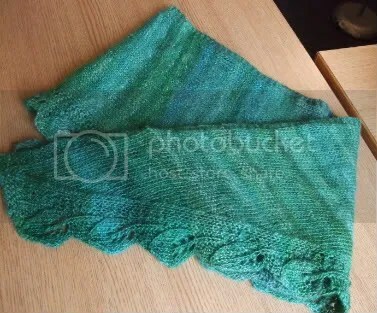 Yarn: My handspun! Probably about a hundred yards of navajo-plied worsted weight SW merino. Pretty. 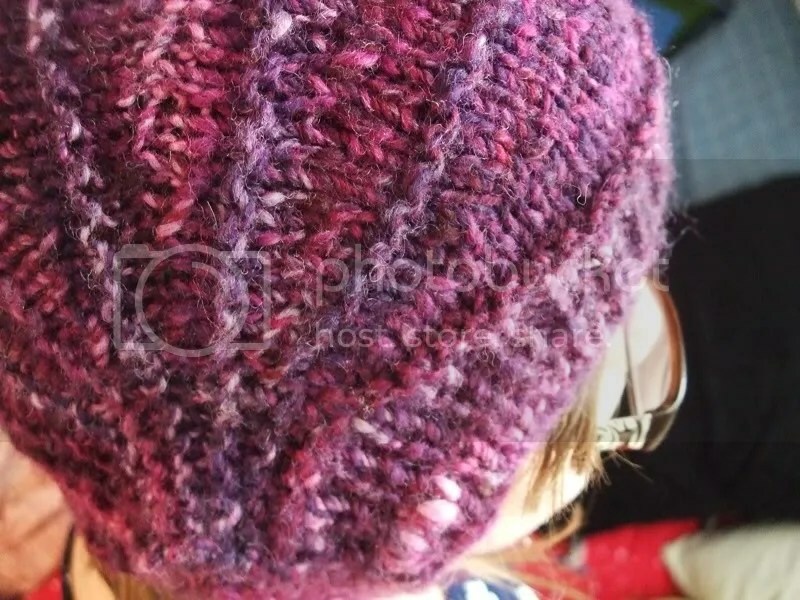 And in that pretty Crown Mountain Farm colorway? Oh god. Love. I have probably about 40 yards left of this batch (with either become a little linen stitch pouch, like what I did with the remains of my green BFL or reskein it and put it in a bowl to be decorative and gorgeous. One of those for sure. Skillz. Or something. I love how it came out. 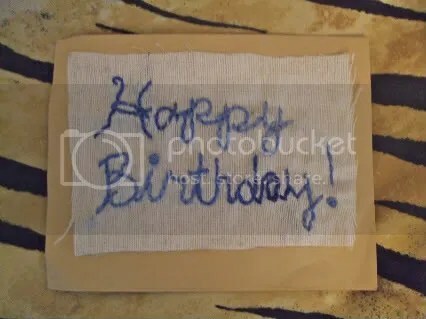 I’m gradually getting hooked on embroidery–I absolutely love the effect. So Happy Birthday to Sarah! Whose birthday was Monday the 7th. Happy (very) belated birthday to Sarah! 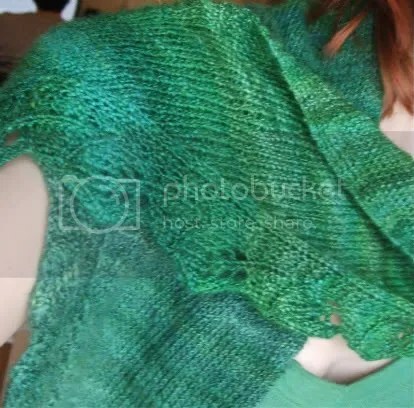 I finished my handspun Swallowtail! 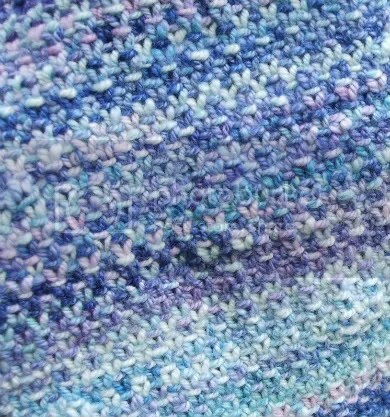 Yarn: My handspun superwash merino. Pretty. 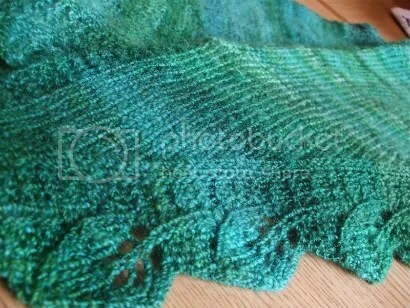 Mods: 19 Budding Lace repeats. I love this thing, guys. It’s wonderful. It’s soft and light and warm and I SPUN THE YARN. 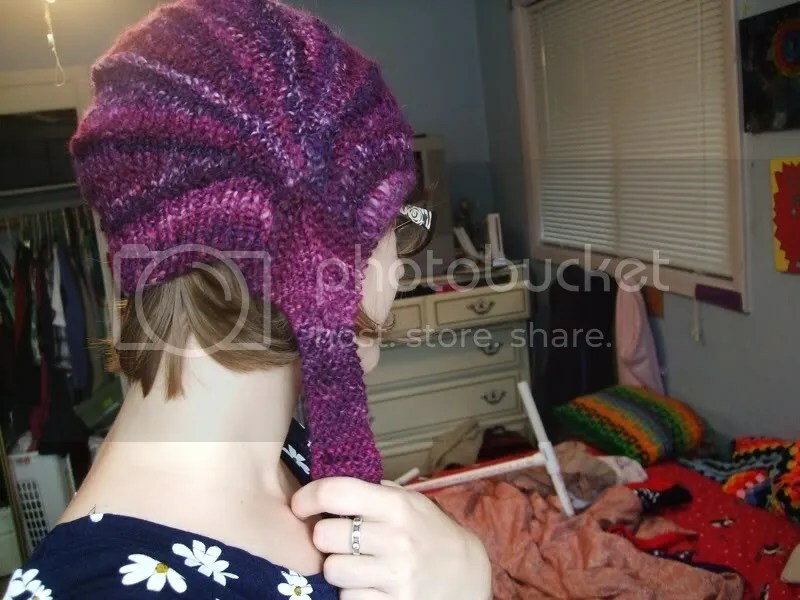 I love this pattern (this is my second, and I don’t really repeat patterns often), and I love the yarn. The colors are gorgeous, and they worked really well with the pattern, which sort of surprised me since I knew it was going to stripe. But it worked out so well. WONDERFUL. I really love it. 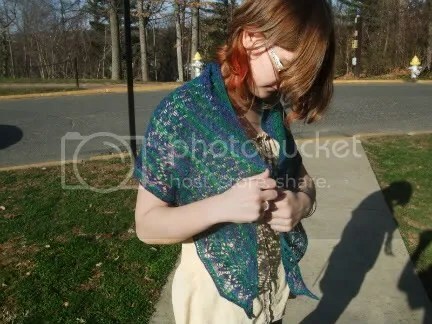 It’s the perfect light layer when my arms are a little cool and it’s SO PRETTY. Okay, I am going to stop gushing now. 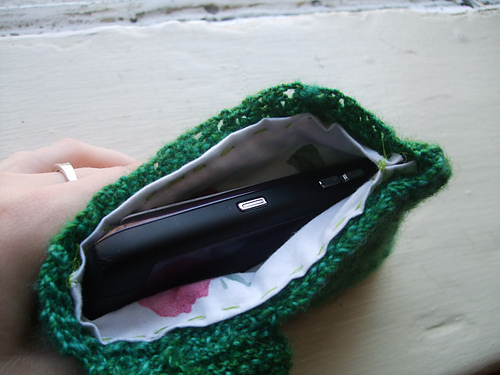 FO: Linen Pouch and some WIP's. Almost done. I’m using the same orange vintage Grants Wool I’ve had for ages and am slowly making my way through. The color is a lot less obnoxious than the bright orange it originally was, but I still don’t love it. 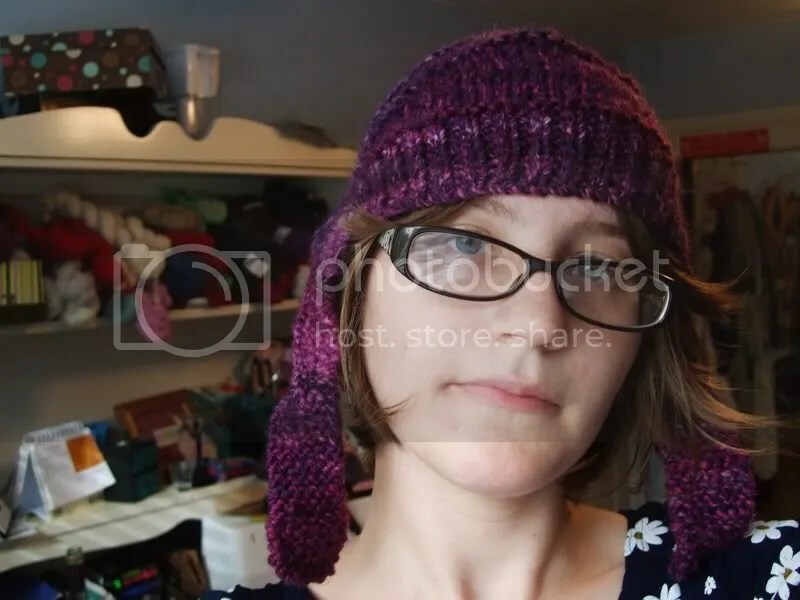 This hat is for a swap. The swap is called “Yarnies Vs. Sewers” and is partnered based on craft, a yarnie (spinner/knitter/crocheter) with a sewer. Sign ups aren’t technically over until next week, but another person and I decided that we needed to be partnered based on the (probably rude) thing I wanted to make for someone. So we insisted, and the mod complied, and we’ve already gotten started (even though the send out isn’t until Mary). I’m making a total of five things, none particularly complicated, and will probably be finished quite early. Or half of it anyway. I got 8 oz. 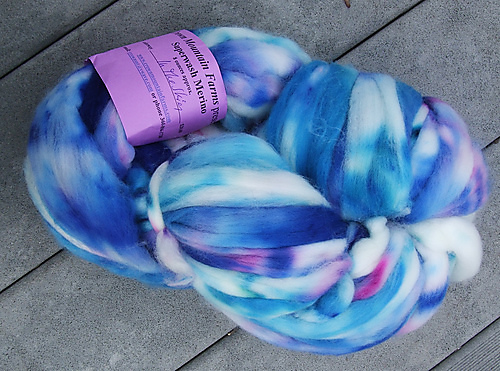 of Crown Mountain Farms superwash merino in a Ravelry destash, and I’m spinning 4 oz. 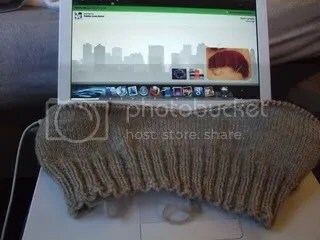 into what will hopefully be a 2 ply worsted that I’ll knit into the yoke of a sweater. 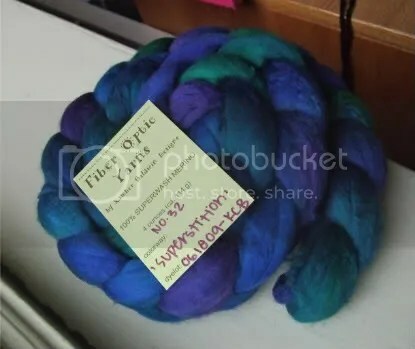 Also, I am waiting on some mail–an OWS swap which I am incredibly excited to receive, and some roving I ordered which is RIDICULOUSLY AWESOME and gorgeous, and I’ll definitely be showing it off here. I expect to get both things on Monday or Tuesday, so stay tuned for that. 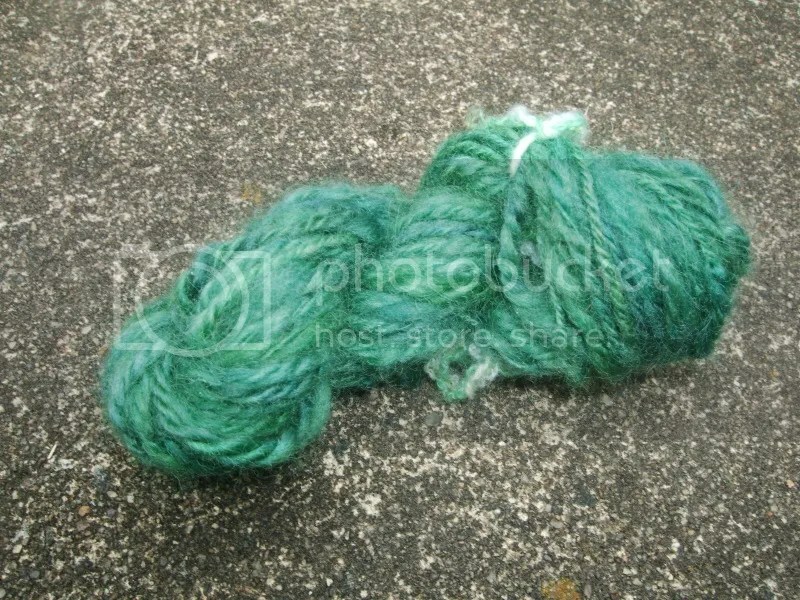 Yarn: My own handspun BFL! Mods: Did seven increase repeats, six decrease repeats (yeah, I’m not sure how that worked out either) and 12 straight repeats. 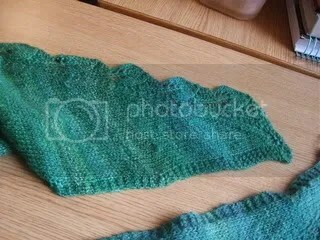 When I started the scarf, I was worried the yarn was too fuzzy and the pattern wouldn’t show up clearly. This was true in the beginning, sort of, because my spinning hadn’t been very even. As the yarn got better, the pattern showed up better, so yay. I’m glad I persevered. 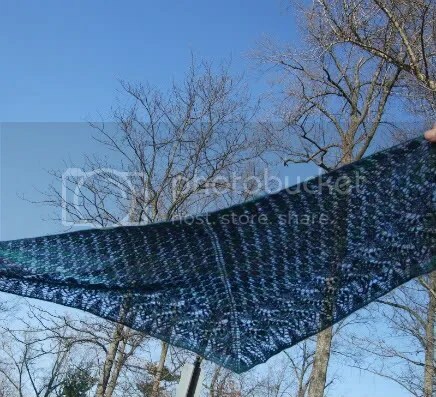 It’s super pretty and the pattern is great. 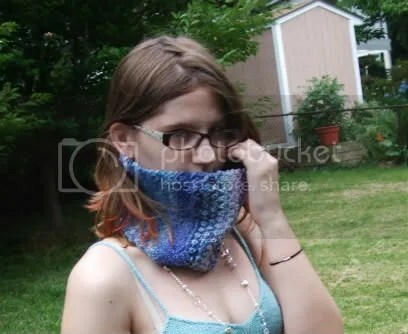 The yarn is also great. Cause I spun it! 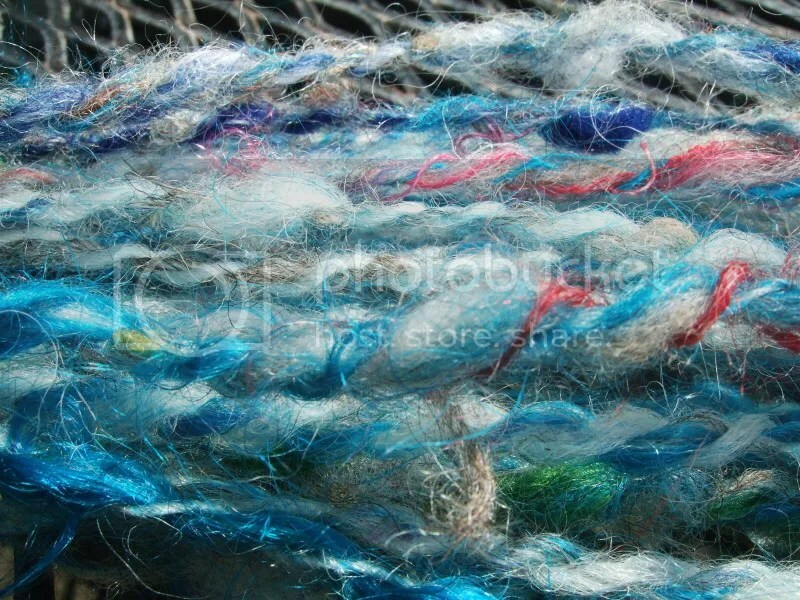 It’s a little rough/ropey in places where I over plied and over spun, but a nice bath evened most of that out and the BFL is soft enough in most places anyway. 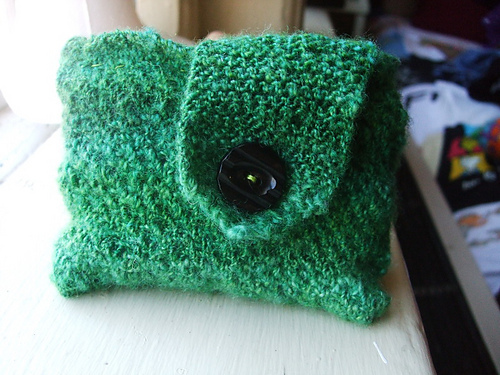 In other knitting news, I’m fixing to have a couple more small things to show off soon. I claimed for another round of OWS for amigurumi and wrist warmers, so that’s happening. Plus the things I was claimed for. Yeah, I’m so getting gold. So I finished a spinning thing! 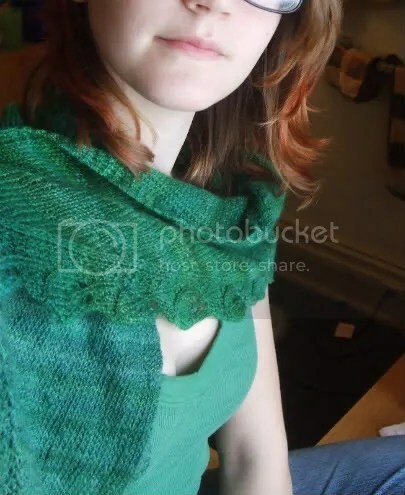 Remember the superwash merino Joe got me for my birthday? Well, I finished spinning it. And it is great. Fiber: Fiber Optic Superwash Merino, in colorway Superstition. 4 oz. Yardage: About 700. I measured the first half, which was 374, but didn’t bother with the second, so I’m estimating about 700.